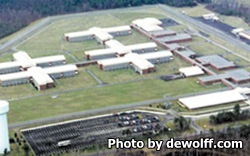 Upstate Correctional Facility is located in Malone New York, part of Franklin County. It is a maximum security prison that houses high risk males. Most of the inmates at this facility have a history of combative behavior, and are considered difficult to manage. The current capacity of Upstate Correctional Facility is about 1,350 inmates. Offenders are secured by multiple razor wire fences, over one thousand security cameras, and 24/7 perimeter patrol. The level of treatment and programs an inmate can participate in is directly related to their behavior. Substance and alcohol abuse treatment services and special education programs are available to offenders. Inmates can also earn a GED while incarcerated. Visits for general population inmates occurs on Saturdays, Sundays and Holidays from 8:30am-2:30pm. You must arrive by 2pm or you will not be allowed to enter into visitation. SHU inmates are allowed visits on weekends and Holidays from 9am-3pm. All inmates are allowed up to four visitors at a time.